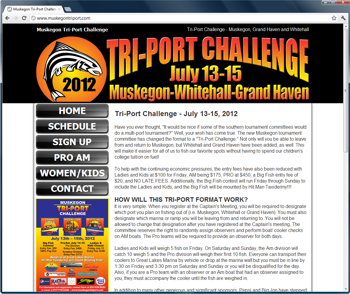 I am in the process of building a website for the Tri-Port Challenge. 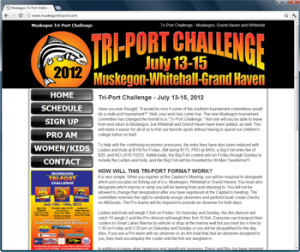 The Tri-Port Challenge is a fishing tournament that takes place in Muskegon, but is unique in the sense that you can start out of ports located in Muskegon, Whitehall and Grand Haven. This tournament has taken place before, but until I was involved did not have a website or an existing logo, so I got to have some fun with this one. I got to do a ground up static build (which if you follow my work, you know is what I like to do). When I first spoke with the clients, they had an existing pdf that they where using for promotion, they did not really like the graphics on it, but did like the color scheme it had going. 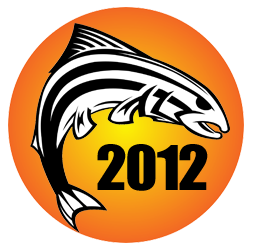 We spoke about the logo and they wanted to go with something with an anime or comic book style fish. I looked around real quick and found a pretty cool bass that was a good starting point, and ended up changing it pretty dramatically to make it look more like a salmon. The fish is pictured above and honestly I am very proud of the way it turned out. I tried to keep the color scheme of the logo pretty simple so it can be cost effective if they are going to use it in their t-shirt design, which I hope they will do, we will see. 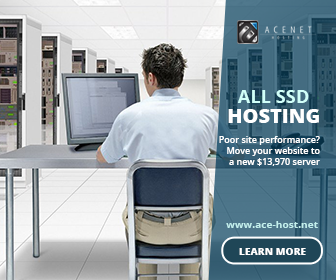 Overall the site design was pretty simple. Side navigation with some cool mouse over buttons, and a good looking color scheme. At the time of this article, I have not gotten all of the info that I need, but there will be a sign up form for the tournament and a way to pay your registration fees right on the spot with pay pal which will be a cool feature. Because this is an annual event I look forward to working with the Tri-Port Challenge committee again in the future as I believe it is a great fishing tournament and event for not only the city of Muskegon, but all of Western Michigan.